Bash is an interesting dragon creature who is talented with the element of earth. He first appeared in Skylanders: Spyro’s Adventure. The thing that makes Bash interesting is that, though he is a dragon, he was born without wings! This has left him without the ability to fly. Not many people know much about Bash, but it is very obvious that he is sensitive about not having wings. Flying is something he has always wanted to do. In his efforts to try and fly, he trained himself to bunch up into a ball and roll very quickly. Unfortunately, this ability did not help him to gain flight. One day, he saw a giant machine that was capturing all of his friends! This is where his rolling ability came in handy. He bunched up tight, and flung himself at the machine with such a speed that he was able to burst a hole in it. All of his friends were able to escape. Master Eon heard about this story and thought Bash was very brave. Soon after, Bash joined up with the Skylanders. Bash also has a counterpart called Legendary Bash. He can only be found at Toys ‘R’ Us stores in the Legendary Pack. Back and better than ever, Series 2 Skylanders Giants are returning from Skylanders Spyro's Adventure with new "Wow Pow" power upgrades and increased level cap "Rock and roll" says Bash. For generations, the Skylanders have used their magical powers and weapons to protect Skylands. But now, an evil tyrant has frozen them and banished them to Earth. Only you can put them on the Portal of Power and bring them to life to save Skylands forever. Collect and build the ultimate army of Skylanders Giants! Each Skylander Giant has their own unique powers and abilities to enhance your game play experience and save Skylands. Bring your Skylanders to life by placing them on the Portal of Power! Bash spent most of his early dragonhood staring into the sky, watching the flying creatures of Skylands soar amongst the clouds. Determined to join them, he learned how to curl himself into a ball and roll with incredible momentum in a vain attempt to take flight. Over the years, his skin hardened, forming a natural protective armor unlike any other creature. He now thunders through Skylands, leaving a wake of destruction against any who threatens it. Despite his thick skin, he still gets a bit touchy about his inability to fly. 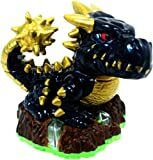 Bring your Skylanders to life! Frozen in our world. Alive in Theirs. For Generations, the Skylanders have used their magical powers and weapons to protect Skylands. But now, an evil tyrant has frozen them and banished them to Earth. Only you can put them on the Portal of Power and bring them to life to save Skylands forever.Build the ultimate army of Skylanders 30+ Skylanders to collect! Each Skylander has their own unique powers and abilities to enhance your game play experience and save Skylands.